Marie Alouette is a Breton herder living in the little village of Water's Edge. Like most of the settlers in the village, she will be killed by a bunch of drug-induced Blackwood Company members during the quest Infiltration. Marie lives a quiet life before her untimely death. At midday she has a two hour meal, and has another at 6pm. The rest of the time she relaxes inside her farmhouse, never sleeping. 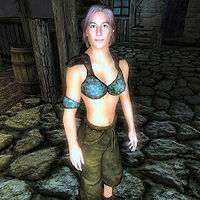 She wears a randomly generated lower-class outfit and wields an iron bow with four iron arrows. She also carries a small amount of gold. She is the victim of a Scripted Death, but is not flagged as an essential NPC. Thus it is possible for her to effectively "die twice". Marie was supposed to venture outside between 2pm and 6pm, but she only has a "find" package with no target item, and the location center is right on the junction between the main road and the small village road. Since there's no target item, she stays inside the house. This page was last modified on 20 October 2015, at 05:35.